North Carolina is famous for its agriculture, growing staples of American life such as tobacco, cotton and produce. But North Carolina's number one crop, for which there is no particular season to plant, is manufactured evidence. Which is contrary to everything we've come to expect from crime scene investigatory protocols. Hell, you don't even have to listen to me. But if you have a sharp eye, you too will see what I saw. And if your mouse finger is nimble and quick enough, it'll catch what I had in these screengrabs. 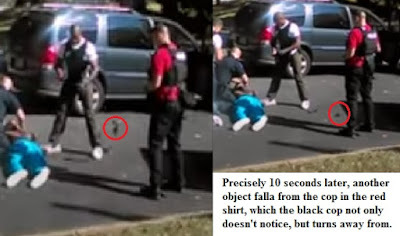 At precisely two minutes in, the phone pans to the left, then you can plainly see something drop down the left leg of the black cop (presumably the one who'd just shot Scott). 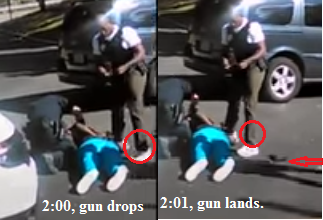 After it lands, anyone who knows anything about guns (and I've forgotten more about firearms than most anyone will likely learn) can plainly see the unmistakable shape of a semi-auto handgun, grip and barrel. The caption in the second image says it all. Two cops drop foreign objects within 10 seconds of each other and nobody at the crime scene seems to notice anything unusual, perhaps because this is business as usual. This is eerily similar to Michael Slager's planting of evidence (his taser he later claimed Scott had tried to grab) after he shot Walter Scott in the back in North Charleston, South Carolina last year. This is why planted evidence even has its own name, its own nomenclature: "throwdown." And this is precisely what we're seeing here in Mr. Scott's widow's cell phone video, twice, within 10 seconds, by two cops, at an active crime scene, to the complete bemusement of everyone present. And that, ladies and gentlemen, is why the Charlotte PD Chief will not allow the dashcam video to be presented as evidence. Because it would show in more vivid detail the items being dropped at the crime scene by two of his subordinates seconds after a fatal shooting of an unarmed man.